Kiribati is a group of 33 islands which form a country in Oceania. Together with 4 other countries, Kiribati forms a group of islands known as Micronesia. The islands stretch 3,900 kms (2,400 miles) from east to west and 2,100 kms (1,300 miles) north to south. Kiribati is in the Pacific Ocean. Check the weather in Tarawa now. The upper half of the Kiribati flag is red with a yellow frigatebird flying over a yellow rising sun. The lower half is blue with 3 horizontal wavy lines of white. The capital of Kiribati is Tarawa. Kiribati is a presidential republic with a President as head of government and head of state. The currency in Kiribati is the Australian dollar. 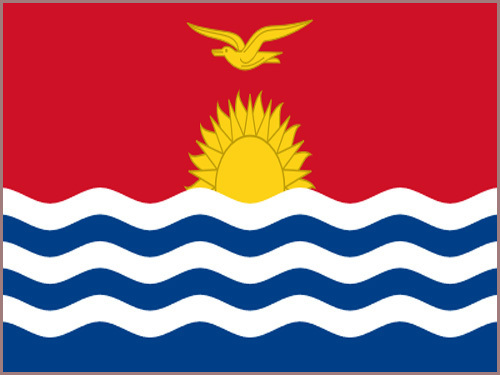 Kiribati is a member of the Commonwealth. English and Kiribati are the official languages. These are the words to the National Anthem of Kiribati called Stand Up, Kiribati. It was adopted in 1979. These are the words. Stand up, Kiribati! Sing with jubilation! Prepare to accept responsibility and to help each other! Be steadfastly righteous! Love all our people! Love one another! Promote happiness and unity! In the days to come. help us with Your loving hand. We have already written our own history of England but are asking schools in Kiribati to provide us with a detailed history of their own country. Check how here. 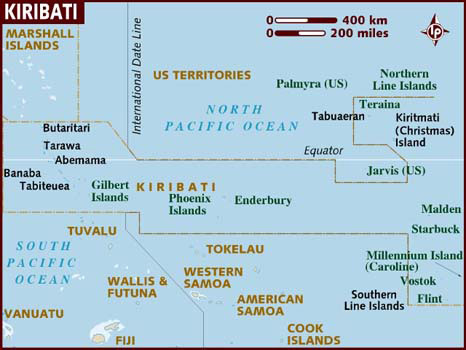 The total land area of Kiribati is 811 sq kms which is the 8th largest in Oceania. Kiribati has no lakes, rivers and canals. Kiribati has no boundaries with other countries. Kiribati has a coastline of 1,143 kms which is the 8th longest in Oceania. The highest point in Kiribati is on Banaba atoll at 81 metres. The total population of Kiribati is 108,127 people, making it the 8th largest country in Oceania by population. 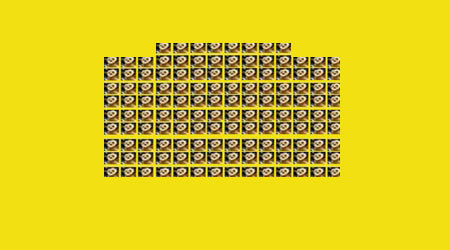 Of this number 55,459 are females and 52,668 are males. A person from Kiribati is called a Kiribati. 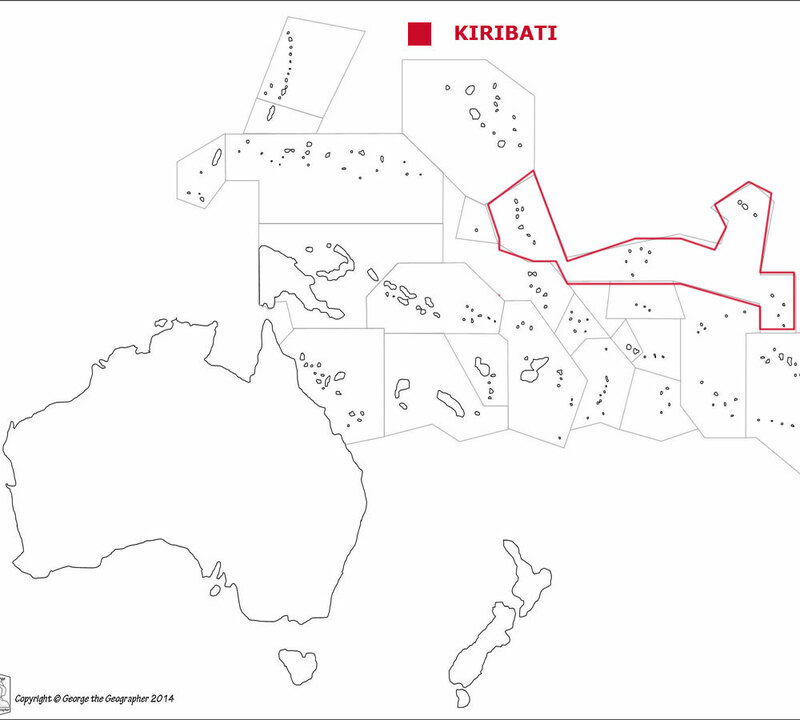 To be a citizen of Kiribati, one of your parents must be a native-born citizen of Kiribati. It is not sufficient to be born in Kiribati. You have to live in Kiribati for 7 years before you can begin to apply for citizenship. 44.3% of the people live in cities or towns. The death rate in Kiribati is 7.1 deaths per 1,000 people. There are 31.8 deaths of girls under 1 year per 1,000 of births and 34.4 deaths of boys. 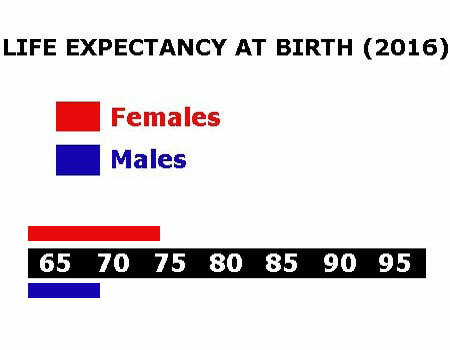 The median age for females is 25.1 and for males is 23.4. 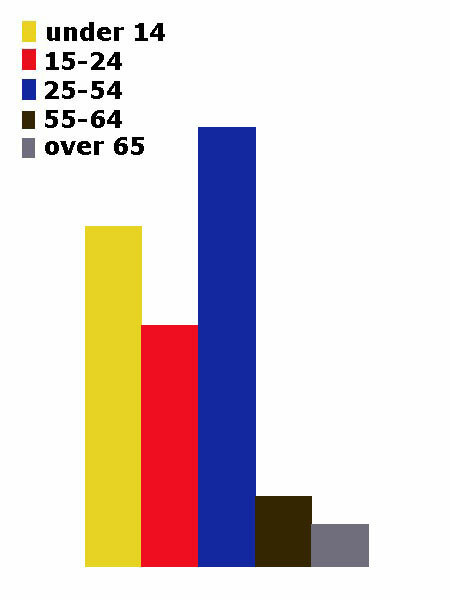 The median age is that age which divides the population exactly in half so there are the same number of people above the median age as below it. The average age of a woman when she has her first child is 23.1. Kiribati spends 10.2% of its total income on health care. There are 0.38 doctors per 1,000 people. 46.0% of the population are estimated as obese. 87.3% of the urban population and 50.6% of the rural population have drinking water that is either piped into their home or they have access to a public tap, a protected borehole, well, spring or protected rainwater collection facility. 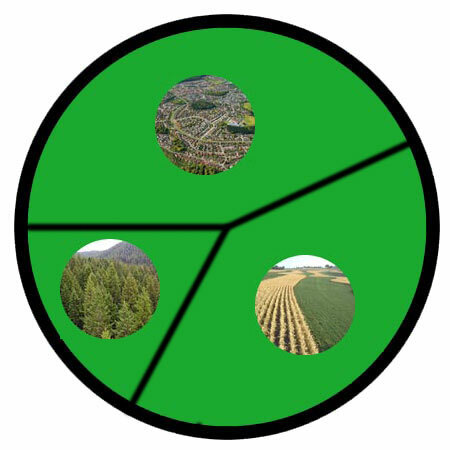 51.2% of the urban population and 13.6% of the rural population have access to a flushing toilet that is connected to a sewer, a pit latrine (that is a permanent hole in the ground that is looked after) or a composting toilet. 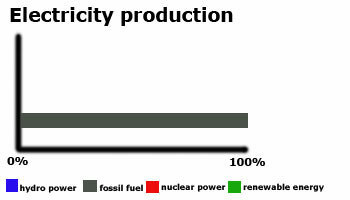 Kiribati releases 0.58 million metric tons of carbon dioxide by burning fossil fuels in the process of producing and consuming energy. This puts it as the 7th highest in Oceania. We have no figures for how much Kiribati spends of its total income on education. Children usually start school at age 6 in Kiribati. Primary education is for six years until age 12 and secondary education must continue till 15. Many children have to live at their secondary schools as they are not available on all islands. This may be followed by further education at a university or college abroad. Generally the school year consists of 3 terms and starts in the first week of February and finishes in the first week of December. There is usually a 2 week break at the beginning of May and another at the end of August. 54.0% of all people aged between 16 and 24 are not in work. Among females 47.6% are unemployed while with males 61.8% can't find work. The total number of people available for work in Kiribati is 39,000. 30.6% of the workforce are unemployed. There are 4 paved airports in Kiribati, which is the 6th highest number in Oceania. There are no railways in Kiribati. There are 670 kilometres of roads in Kiribati, which means Kiribati is in 10th place for the most kilometres of roads in Oceania. There are no major national newspapers in Kiribati. There are 55,000 mobile phone users. 14,649 people have access to the internet at home via any device (computer or mobile).